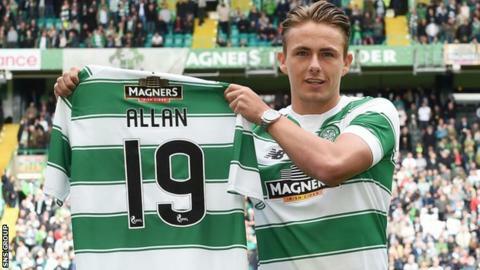 Scott Allan insists that he only considered the football implications of his move from Hibernian to Celtic. He accepts that he will be the target of some criticism, having grown up a Rangers fan and being the subject of three transfer offers from Ibrox. They were all rejected by Hibs, though, and Allan said it was an "easy decision" to join Celtic. Allan handed in a transfer request after Rangers' initial offers were rejected this summer and he was widely expected to move to Ibrox even if it meant running down the final 12 months of his contract at Easter Road. Celtic officially made their move for the player on Thursday, though, and Allan was certain it was the right choice to make for his career. "When I heard from my agent that Celtic were interested, in football terms it was an easy decision to step up a league and European football - and to develop as a player," he said. "I was just concentrating on my game and, if something came up, I'd need to make a decision. Luckily for me, it was Celtic and that was the decision I made. "I just made it on football terms, I wasn't really bothered what came with it. "I know I'll get a lot of stick off some people, but it's about playing football and developing and this is the right place for me." When asked if the recent focus on being a boyhood Rangers fan had been exaggerated, Allan said "yes". He also added that he would continue to live in Glasgow. "My job is a football player," said the midfielder who started his career with Dundee United and joined Hibs last summer after a spell with West Bromwich Albion. "You need to look out for your best interests and that's what I've done in coming to Celtic. "My family support me in any decision I make and that's what I'd expect from them." Allan was also asked if Rangers made a late attempt to talk him out of moving to Celtic. "Not that I know of," he replied. The midfielder is also hopeful of being involved in the squad for Celtic's Champions League play-off first leg against Malmo at Celtic Park on Wednesday. "There's been talk, but I just need to train hard and see what happens," said Allan, who had loan spells with Portsmouth, Milton Keynes Dons and Birmingham City. "It's going to be a challenge to get into the team, but that's something I'm looking forward to and I have faith in my own ability to do that. "I'm much older now, I've got a lot of experience I took from down south and I won't let the chance pass me by again."